Mairead qualified from U.C.D. in 1978 and worked in mixed practice for several years before moving to Millstreet to set up practice with her husband Michael. 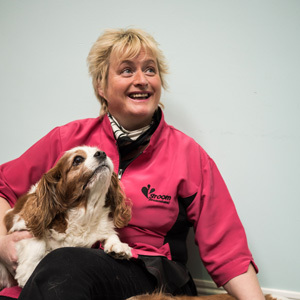 Mairead is responsible for the day to day running and organisation of the practice, whilst still being an active member of the small and large animal veterinary team. 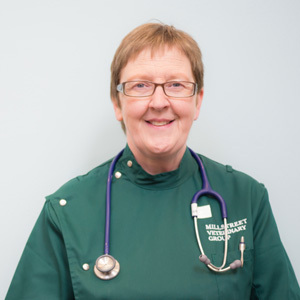 Mairead is an active contributor to veterinary politics, being the current 'Food animal' representative for North Cork, member of the National Council of Veterinary Ireland and member of the Veterinary Ireland working group on Anti-microbial resistance. In her spare time, she enjoys reading, walking in the countryside with her red setter 'Sherry', and adding to her ever growing fine wine collection. Liam qualified from U.C.D. in 1980. 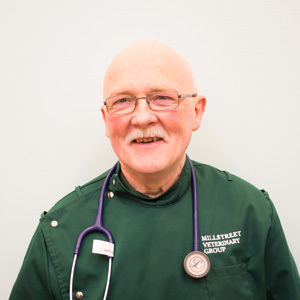 Having briefly worked in large animal practice in Meath and later in small animal practice in Co.Dublin, he has been working in Millstreet since the early 1980's. He is involved in all aspects of veterinary medicine, both large and small, and spent several years as local veterinary officer for the county council in the Duhallow area. More recently he has been developing his interest in animal behaviour. Liam is married, has two grown up daughters and one grandson. In his spare time Liam is involved in town twinning – both visiting and welcoming citizens of Millstreet's twin town – Pommerit le Vicomte, France. Outside of work, Liam is passionate about music, gardening and breeds salmon faverolles. 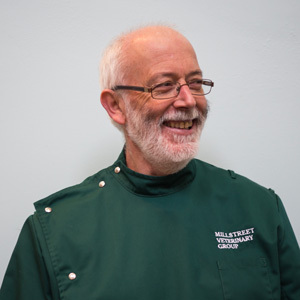 Michael qualified from U.C.D in 1978 and after working in mixed practice in various parts of the country for a few years, felt the call to return to his hometown of Millstreet. 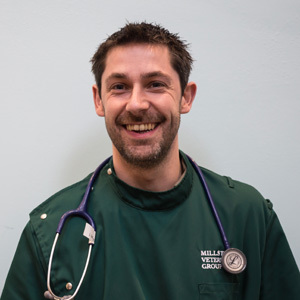 Having grown up on a Dairy farm, Michael's main interest has always been cattle medicine, and he has recently taken this interest a step further by completing the postgraduate certificate in Dairy Herd Health at University College Dublin. 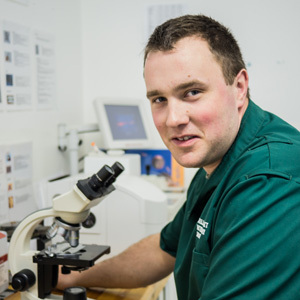 This 2 year course has equipped him with the advanced skills required to maximise the potential of the dairy herd through herd health planning, nutrition, reproductive medicine and mastitis investigation. In his spare time, Michael enjoys running, hillwalking, and playing the occasional game of soccer. Andreas grew up in East Germany and graduated from Berlin University in 1995. Before Joining MVG in 2000, he worked in small animal practice in Charlotte, North Carolina. 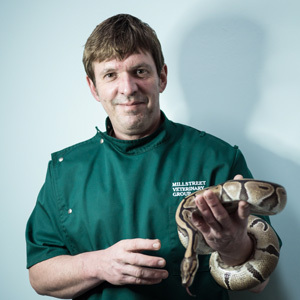 Andreas has owned various pets including dogs, cats, reptiles, tropical fish, chickens and ducks, to name just a few! Outside of work Andreas enjoys playing soccer, fishing and motorbikes. Greg is from Ballygunner in Co.Waterford. Having previously studied Agriculture in U.C.D., he returned to college to pursue a career in Veterinary Medicine, qualifying in 2013. He joined our team soon after graduation. Outside of work, he enjoys fishing, rugby and taking to the fields with his dog, Hudson. He also keeps and breeds a number of reptile species. John graduated from U.C.D. and has worked in the practice since 2013. He enjoys working with all animals, both large and small. In his spare time John enjoys working on his family farm. He has a rottweiler called Missy at home in Buttervant. 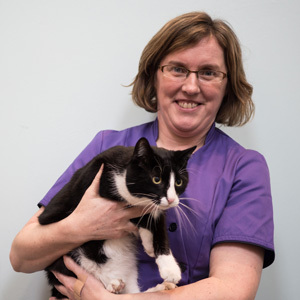 Aoife qualified from St.John's Central College Cork in 2008 as a veterinary nurse and started working in MVG straight away. She comes from a farming background and has a keen interest in both the large and small animal sides of the practice. 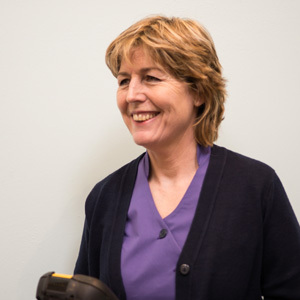 Her duties include looking after the animals under our care and maintaining the cleanliness of the surgery area. She is also responsible for office duties within our busy practice. 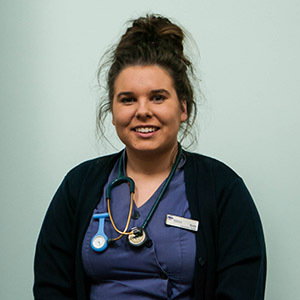 Katie qualified as a registered veterinary nurse in November from St John's Central College and began working in MVG July 2016. She travels everyday from Cork city and has a keen interest in small and large animal. She has started nursing weight clinics which she is very passionate about and even has her own Cavalier King Charles Sammy on a diet. Katie enjoys dealing with queries and talking to clients. Her tasks include monitoring and caring for sick patients and dealing with clients in the office and on the phone. Outside of work Katie enjoys travelling, cinema and socialising with friends and animals. Marie joined our team in May 2006. Being a dairy farmer's daughter from Kilbrin, she knows the everyday life of working on the farm. Marie enjoys dealing with clients calls and queries. When Marie is not at work, she is busy looking after her two children, husband and their family pets at their home near Rathmore, Co.Kerry where she always flies the Rebel colours. 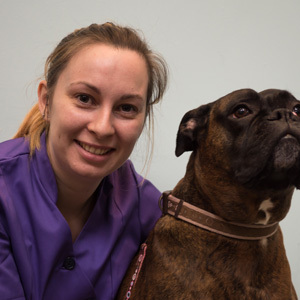 Yvonne has worked as a groomer at MVG since 2012. Before this she lived in the UK for 26 years, working as a social worker with people with learning difficulties. She returned to Ireland and completed FETAC level 5 and level 6 in animal grooming at St.John's College, Cork. Yvonne is a keen golfer and active member of Kanturk Golf Club. She loves animals, walking, travelling and gardening. 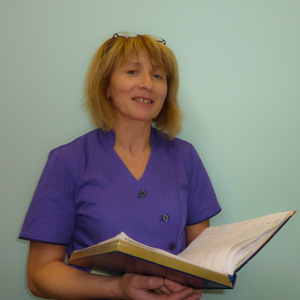 Aileen has been working in the practice since 2008. Married to Jerry, together they run a mixed farm in the shadows of the Island Wood. She has successfully competed in all aspects of equestrian sport and is delighted to see her boys Ben, Jerry and Darragh now competing on the Horse and Pony racing circuit. Assisting our veterinary team on the bovine TB testing programme is one of her main roles. She also spends time serving our customers in the ever busy office and shop. Margaret works part-time as a receptionist in our office every Saturday. Margaret hails from Carriganime, is married to Denis, and has a young daughter. She enjoys working on their dairy farm in Rathmore.